BAFF – Make Mine Criterion! 5 Great Reasons to Attend the Buried Alive Film Festival – The November 18th Edition! 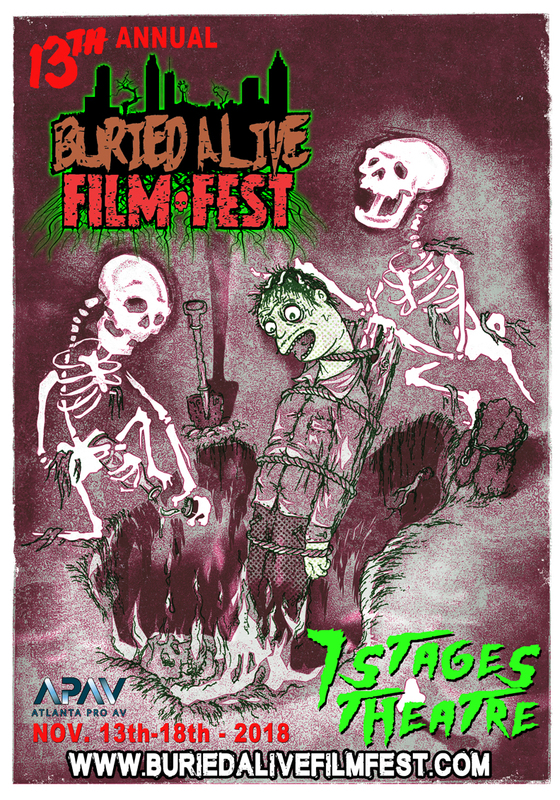 The Buried Alive Film Festival wraps up this Sunday and MMC! is here to tell you why you should go! In addition to another screening of The Golem with a live score by the band Samadha (just in case you miss the screening and performance this Friday), there are two feature films, two supporting shorts, the “Why Bury Good Meat?” short program, and BAFF’s awards ceremony. Action, Documentary, Festival Reports, Film, Funny, Horror, Music, Shorts, USA2010s, Aaron Pagniano, Anthony Cousins, BAFF, BFF Girls, Bill Fulkerson, Body Parts, Brian Lonano, Buried Alive Film Festival, Color, Comedies, Comedies That Bite, Documentaries, Girls Raising Hell, Independent American Cinema, Jon Rhoads, Kyle Kuchta, Making Music, Mike Marrero, Revenge, Riley Was Here, Scary Movies, Short and Sweet, Special Effects, Supernatural Stories, Survival of the Film Freaks, Suspense!, The Bloody Ballad of Squirt Reynolds, United States, Vengeance, We Got a Monkey's Paw, Widescreen, Zombies! 5 Great Reasons to Attend the Buried Alive Film Festival – The November 17th Edition! The Buried Alive Film Festival’s program for Saturday, November 17, is STACKED with three new feature films, one rep-pick, two supporting features, the Eyeslicer short film program, nine more short films in the “It’s Never Too Early to Start Digging Graves” block, and one burlesque show compliments of Blast Off Burlesque. Now that’s a full day of entertainment! 5 Great Reasons to Attend the Buried Alive Film Festival – The November 16th Edition! Sure, MMC! made the Buried Alive Film Festival’s first day of full programming sound great, but BAFF really comes into its own on Friday, November 16th. There, BAFF offers three feature-length movies, one live score, one supporting short, and a full program of 10 short films entitled “Bury Me With My Favorite Films.” There’s plenty to see and enjoy at the 7 Stages Theatre this Friday. Those on the fence about attending or those looking for a preview of what to watch thankfully have MMC! to point the way. Here, dear reader, are MMC!‘s five favourite reasons to BAFF this Friday! 5 Great Reasons to Attend the Buried Alive Film Festival – The November 15th Edition! MMC! will cover the 2018 Buried Alive Film Festival by previewing each day of its programming, focusing on those wonderful films that achieve MMC!-approval! With BAFF’s emphasis on short films and a full program of these titles playing each day the Fest, there’s hardly any limit on the number of good reasons to attend! BAFF kicks off on November 14 with a screening of the films made as part of its 3rd annual Sinema Challenge, a 13 day filmmaking challenge that sees its participants randomly select a horror genre and a subject from a deck of Cards Against Humanity cards and then make a movie based on their selections. The Fest’s main program starts on November 15 with a feature, a supporting short film, and BAFF’s first short program: “For the Love of the Undertaker.” For those counting, that’s thirteen separate works in a single evening of film fest-ing! There’s lots to enjoy, but here are MMC!‘s five favourite reasons to BAFF next Thursday. A big MMC! shout-out to the 2018 Buried Alive Film Festival! (Hi Blaine!) The BAFF strives “to promote true underground filmmaking in the Southeast and beyond, while providing the Atlanta area with the best independent horror has to offer.” This year’s edition boasts seven features films ranging from absurdist comedy to documentary to extreme horror, as well as four special event screenings and a ton of shorts.